Sunday September 16th is the closing day of the Santa Cruz County Fair. Opening at 10:00 am, there are tons of exhibits, fun attractions, and entertainment to keep Fairgoers excited till the very end. Those who love dance can enjoy the performances by local groups. Dancenter and Damascus light up the Amphitheater Stage at starting at 11:00 am, with Belly Dance Basics and Step Dance Studio following at 1:00 pm. Always a favorite, the All Alaskan Racing Pigs start their races at 12:30 pm with several shows later in the afternoon. Fairgoers will also be amazed by Sea Lion Encounter and people can even get a chance to meet one of the talented Sea Lions. Down in the Main Arena, the Charro Horseshow with Banda Oro Verde begins at 5:30 pm. For crowds who are looking for a laugh, The Best Dressed Goat Contest will begin at 1:00 pm in the Livestock Arena. The Tractor Parade will be circling starting at 2:30 pm and then fairgoers can see the livestock results in the Awards Ceremony at 3:00 pm. The nighttime entertainment on the Amphitheater Stage is Pro Wrestling Revolution. The Revolution will feature both American style and Spanish Lucha Libre wrestling. Both established and upcoming wrestling stars can be seen on the stage at 7:30 pm. Crowds looking for something one might not always see will enjoy every thud and groan, airplane spin and body slam off the top turnbuckle in Revolution on Sunday night at the Fair. One of the last performances crowds can catch at the Fair this year is Hypnotist Michael Mezmer. People who are there for the 8:45 pm show will be witness to Mezmer’s 200th performance. By the end of this show, he will have hypnotized 2,000 people and entertained more than 50,000 at the Santa Cruz County Fair. His shows are designed to enthrall, surprise, and entertain. Under his mesmerizing power, unsuspecting audience members face their fears, lose inhibitions and become a highly entertaining focus of the show. Don’t miss his mesmerizing 200th show as the finale act of the 2012 Santa Cruz County Fair. 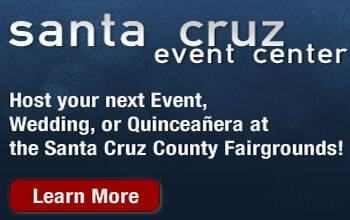 The Santa Cruz County Fair is now through Sunday September 16th at the Fairgrounds in Watsonville. The Fair runs opens at 10:00 am Sunday. Admission at the gate is $10 for adults, $5 for children, and $6 for seniors. Parking is $5 at the Fairgrounds. More information and schedules can be found at santacruzcountyfair.com.